Can the gang get any crazier on season 13 of the It’s Always Sunny in Philadelphia TV show on FXX? As we all know, the Nielsen ratings typically play a big role in determining whether a TV show like It’s Always Sunny in Philadelphia is cancelled or renewed for season 14. Unfortunately, most of us do not live in Nielsen households. Because many viewers feel frustration when their viewing habits and opinions aren’t considered, we’d like to offer you the chance to rate all of the season 13 episodes of It’s Always Sunny in Philadelphia below. Airing on the FXX cable channel, It’s Always Sunny in Philadelphia revolves around five underachievers who run Paddy’s Pub in South Philadelphia — Mac (Rob McElhenney), Dennis (Glenn Howerton), Charlie (Charlie Day), Dee (Kaitlin Olson), and Frank (Danny DeVito). In season 13, the gang is back together — sort of. Dennis takes on the new role of father in North Dakota while his buddies continue their scheming ways at the bar. Could they be happier and more successful without him? 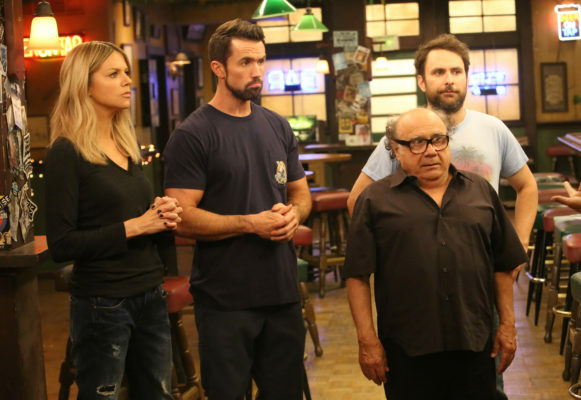 Even without Dennis, the gang has still has its hands full: Charlie hopes to have a child with The Waitress, Mac wants to understand his newfound sexuality, Dee takes feminism to new heights, and Frank is intent on the Gang experiencing the greatest moment in Philadelphia sports history — an Eagles Super Bowl victory. What do you think? Which season 13 episodes of the It’s Always Sunny in Philadelphia TV series do you rate as wonderful, terrible, or somewhere between? Should FXX have already renewed this comedy for a 14th season? Don’t forget to vote, and share your thoughts, below. More about: It's Always Sunny in Philadelphia, It's Always Sunny in Philadelphia: canceled or renewed?